This is the first year since I started doing storytime 4 years ago that I won't get to do a "Shark Week" storytime, because I changed jobs and as it works out, I won't do a storytime in my new job until regular programing resumes in September. I'm a little bummed, as it's one of my very favorite themes, but it couldn't be helped. 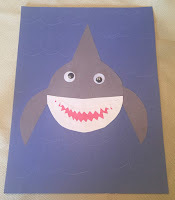 However, I DO have the "Shark Week" storytime plan that I prepared for the interview that got me the new job. It uses components I've used in previous Shark Week storytimes, plus a couple of new additions. Storytime always starts with our welcome song, then I have several things to include as part of the introduction. 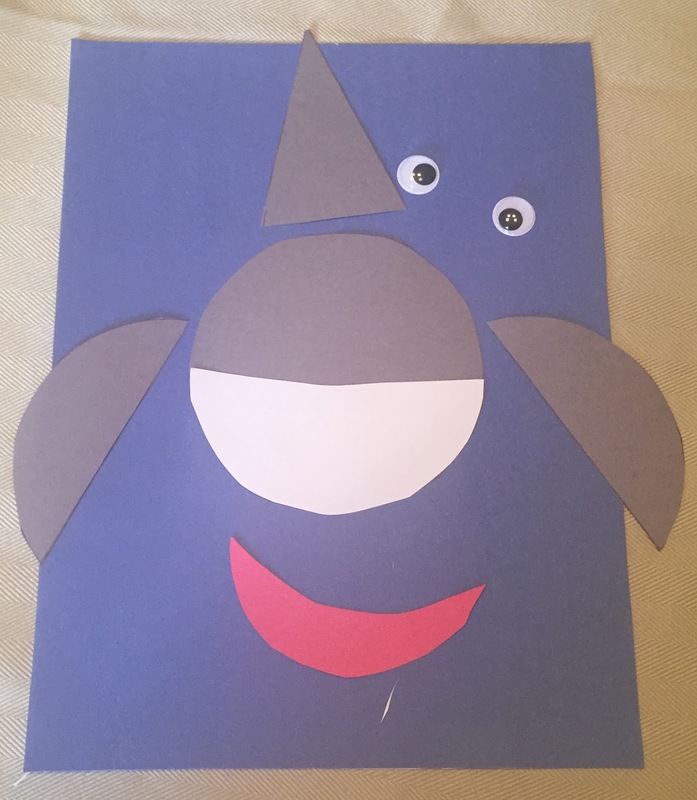 First up is the shark puppet above to greet the kids with his toothy grin, and many kids will want him to "bite" their fingers. 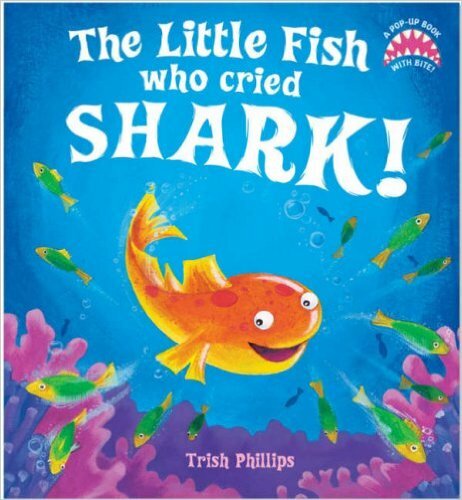 Then I would use a non-fiction book like this one to show some different kinds of sharks and share a couple of interesting facts. Next, I have a couple of things for "show & tell". One is a small collection of fossilized shark teeth I found while vacationing on Manasota Key, Florida, and the other is something I made to let the kids get a sense of what a shark's skin feels like. Many assume it would be smooth, possibly slippery or even slimy because sharks are fish, but in fact it is rough and feels much like sandpaper. 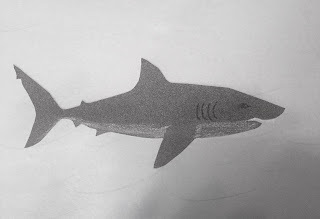 I searched everyone and finally found dark gray sandpaper and cut out a shark shape and glued it to a piece of cardstock and added detail and shading with a white colored pencil and a sharpie. 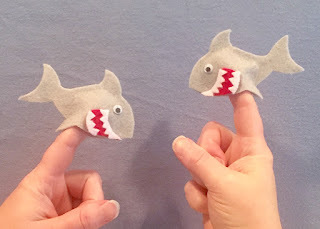 The kids can then "pet" the shark and feel its rough "skin". After that is my usual lead-in song, "If You're Ready For A Story". 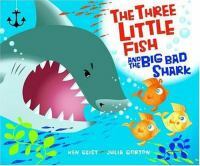 The book that I read for my interview is one I've done many times, and have so much fun doing, The Three Little Fish and the Big Bad Shark by Ken Geist and Julia Gorton. It's obviously a re-telling of the classic Three Little Pigs, but I think is even more fun. I love all the repetition, which makes it easy for the kids to participate and say it along with you. Another fun book is the classic Shark In The Park! by Nick Sharratt (or the sequel, Shark In The Dark). In this story, Timothy Pope is at the park, looking through his telescope; he looks up, he looks down, he looks all around. 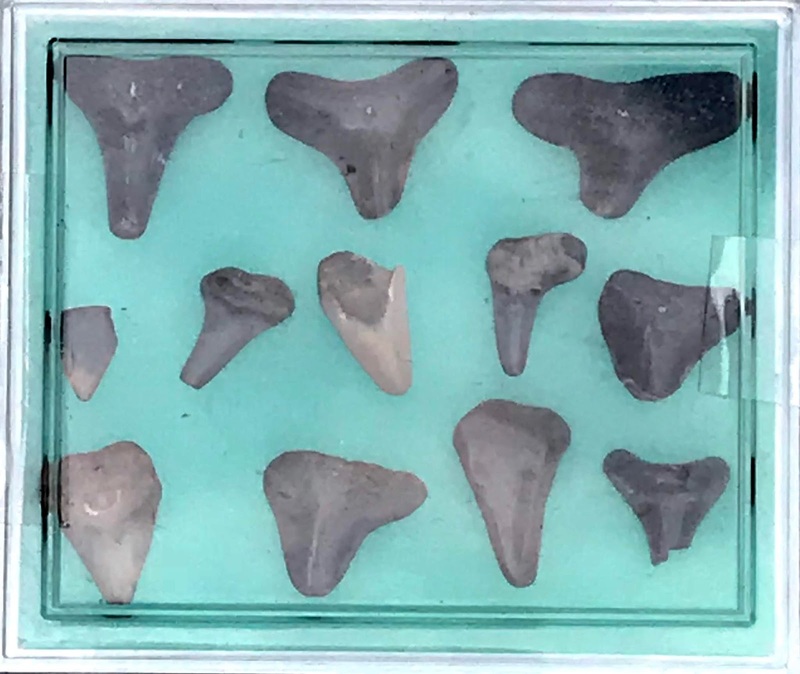 He keeps thinking he sees the dorsal fin of a shark, but it turns out to be something else. 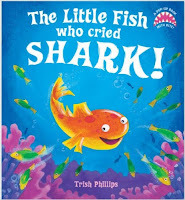 This is particularly good for younger kids, as the text is short and simple, and they can can pretend to look through their telescopes as well, and predict whether Timothy Pope really sees a shark, identify what it really is, and make the appropriate animal sounds. Little Sprat loves playing tricks, and his favorite is to yell "Shark!" and watch everyone scramble to hide. But he eventually learns that sharks are nothing to joke about! 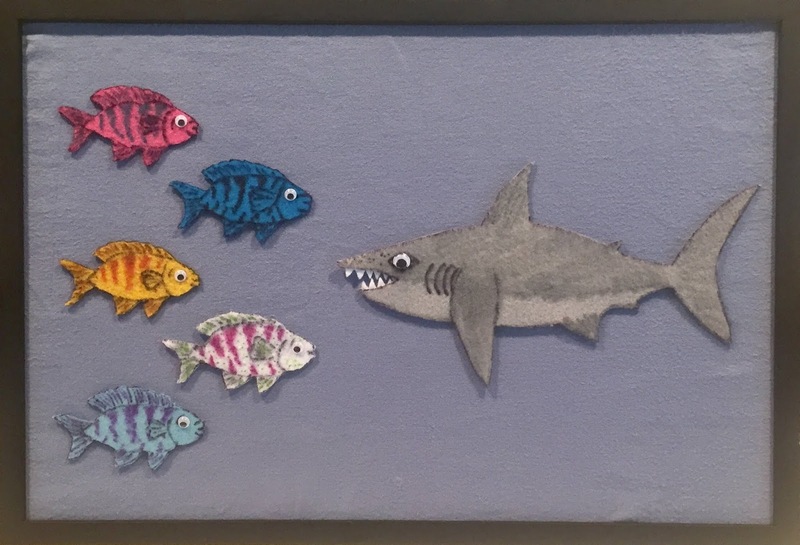 This one is slightly heavier on text, but it has a good rhyme and rhythm, and kids LOVE the last page with a giant pop-up shark! A final book I had as an option for older kids is the latest installment of the There Was An Old Lady Who Swallowed a.... series that is perfect for a Shark or Ocean theme, There Was An Old Mermaid Who Swallowed A Shark by Lucille Colandro and Jared Lee. Older kids who know the original song love all the other versions, and love the pure silliness of them. This one has a few facts about the various creatures sprinkled in, with more detailed information in the notes at the end. 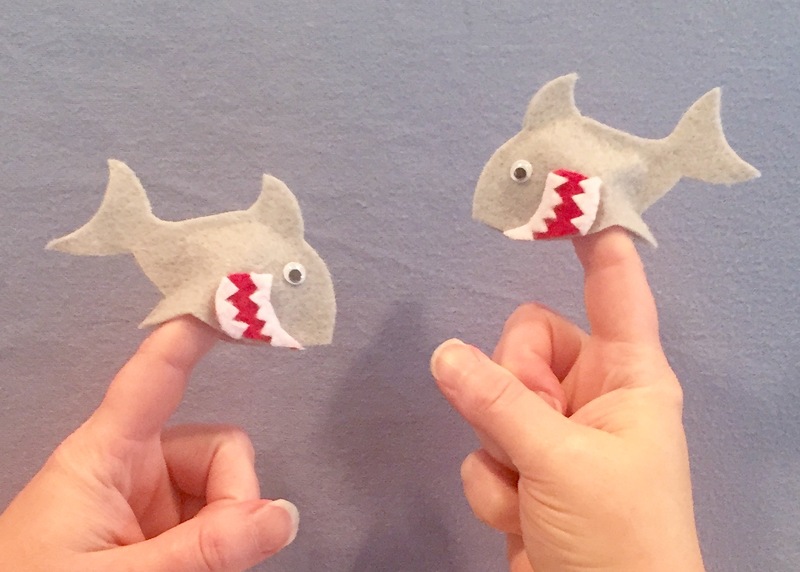 I have several fun songs to with these theme that I've used before: Baby Shark, Slippery Fish, and The Creatures In The Ocean Go.... (to the tune of "Wheels On The Bus", and let the audience suggest animals and sounds/motions to go with them). Then for my interview I made two new felt sets that I've featured earlier for "Flannel Friday". I'll show the pictures, and link to the original Flannel Friday posts for all the details. And finally, a craft. This is something new for me, as we did not do crafts in outreach storytimes since we did so many. 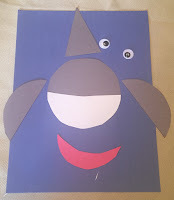 I saw some that I liked, but did not think they were appropriate for the younger kids I would expect for this particular storytime, so I settled on this simple one that used a CD or similar circular pattern to create pieces to assemble into a shark that greatly resembles a certain literary shark. While I haven't had the chance to put this exact plan into practice yet, evidently the hiring committee liked it, because I just finished my second week in the position! 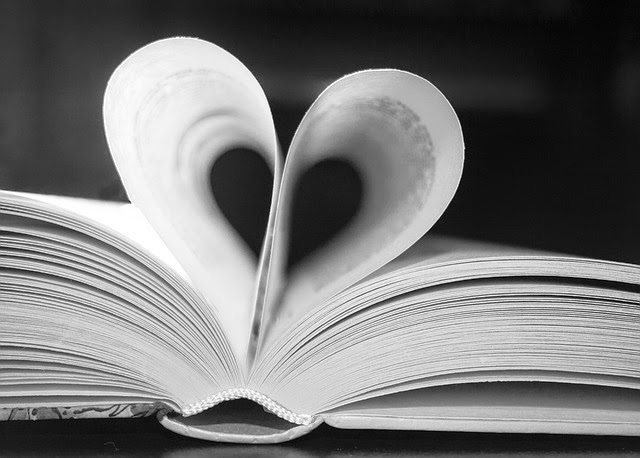 Right now I'm just working the desk, but will start regular programming in September, with one family storytime and one school-aged STEAM program each month.